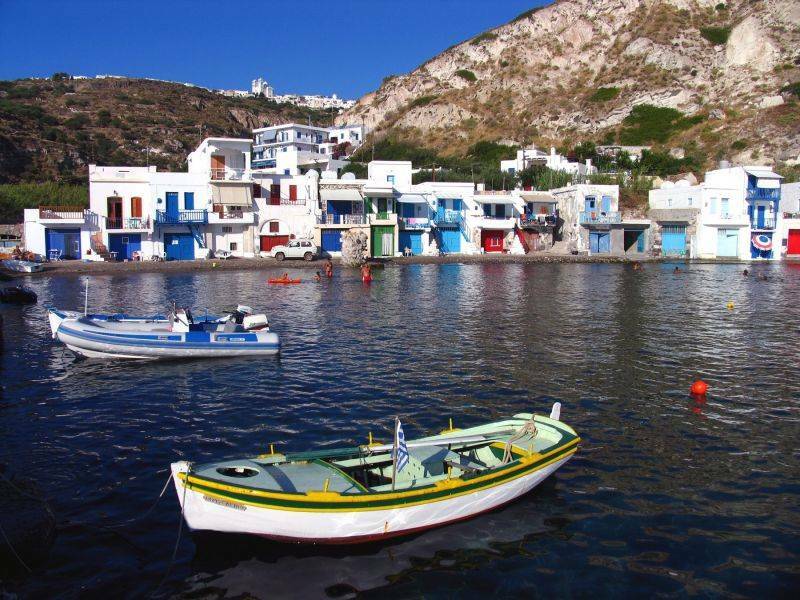 Milos is a wonderful island of Cyclades, full of surprises and special charm. There numerous beaches are amazingly beautiful and each one completely different. Beautiful sights and surprises await you on each excursion. 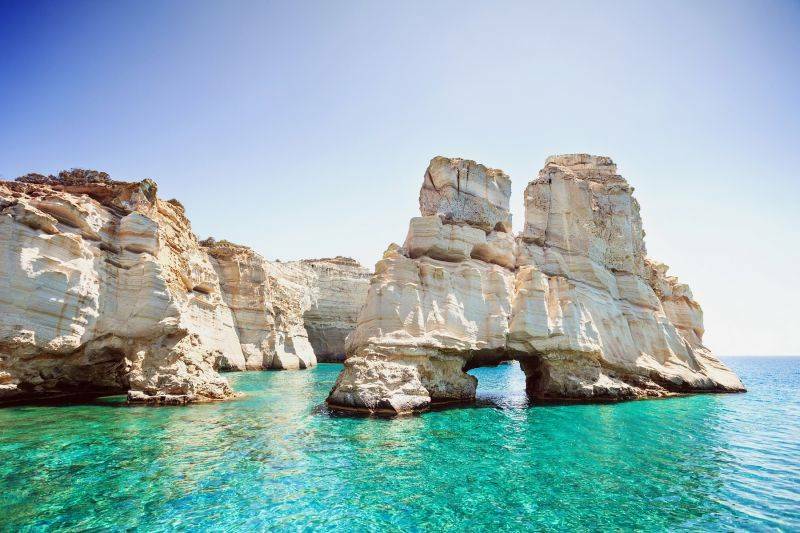 The scenery is in some areas volcanic with splendid multi-coloured rock formations and in other areas typical of the Cycladic tradition consisting of white and blue, the colour of the sea and sky. 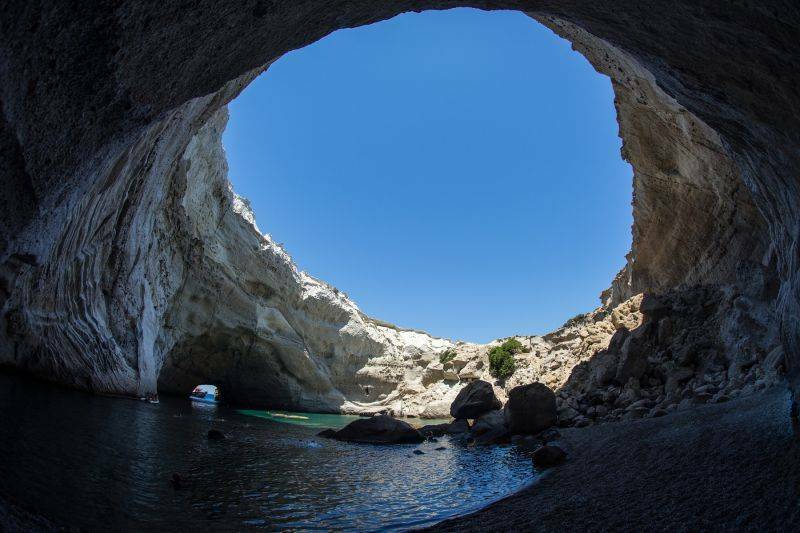 Sikia is one of the most beautiful and biggest sea caves of Milos. 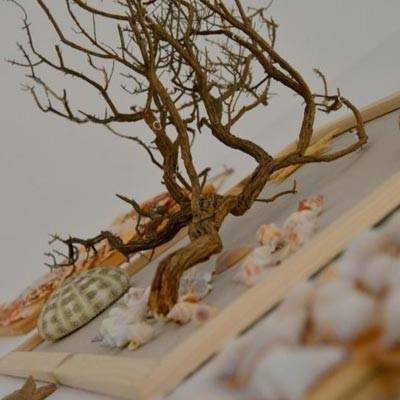 It is located in the southwest part of the island, 13,6 nautical miles from Adamantas. You can approach it with boats that tour around the island. Ask, before you book, if they stop for swimming in Sikia cave. A lot of them, only stop outside the cave without go inside. Characteristic of this cave is that a boat can pass through its entrance. And this is because it has a height of 5m and width of 20m. A natural skylight was created after the fall of the roof that filled the cave with light. Sunbeams light the cave's interior and make beautiful colorings that charm sensations. 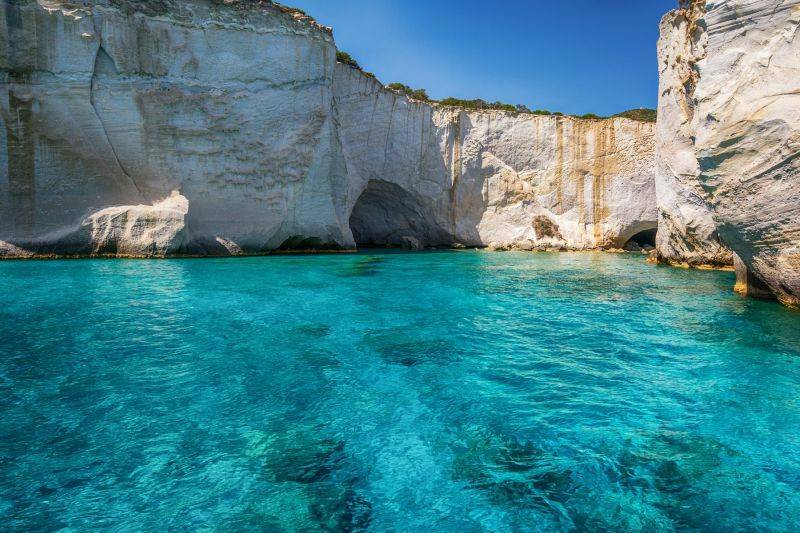 It is a once in a lifetime spectacle that only the visitor of Milos can experience! 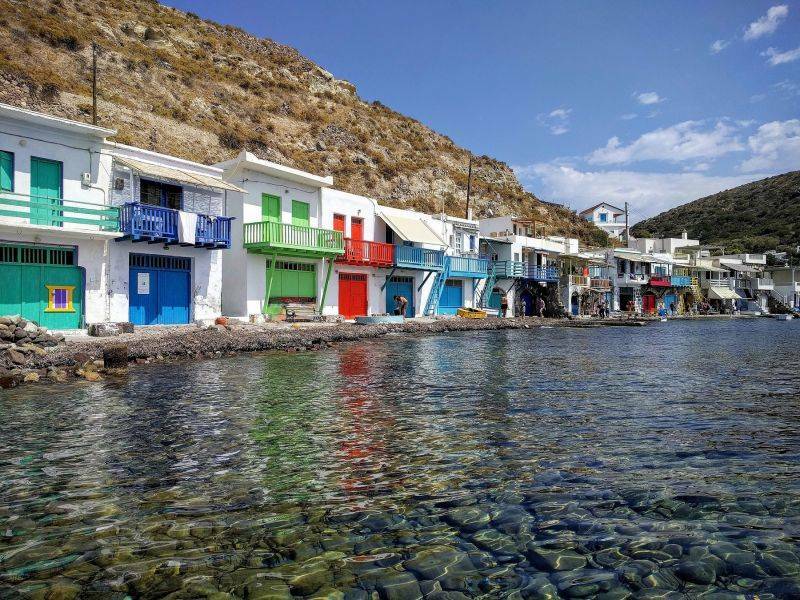 In the east side of Milos lies Paliorema, a bay with crystal clear waters and yellowish pebbles, colored by the sulphur. 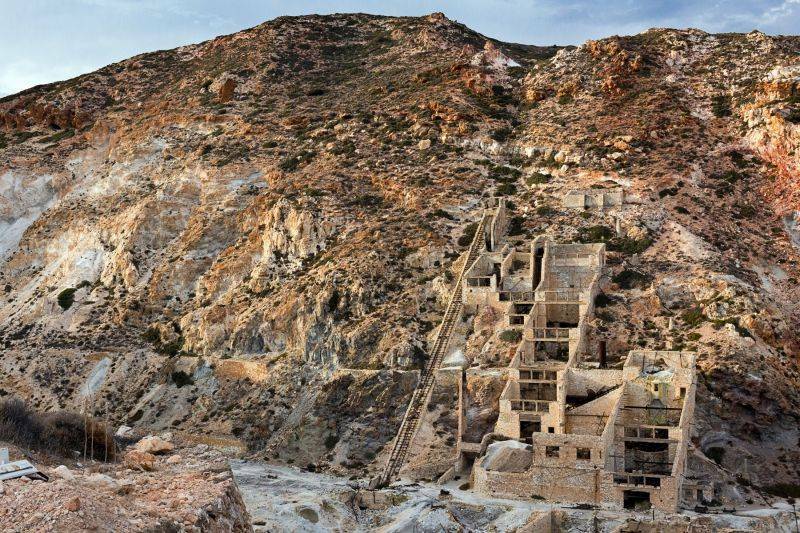 There the sulphur mine of Victor Melas used to be in operation, the oldest business for the mining of sulphur all over Greece. 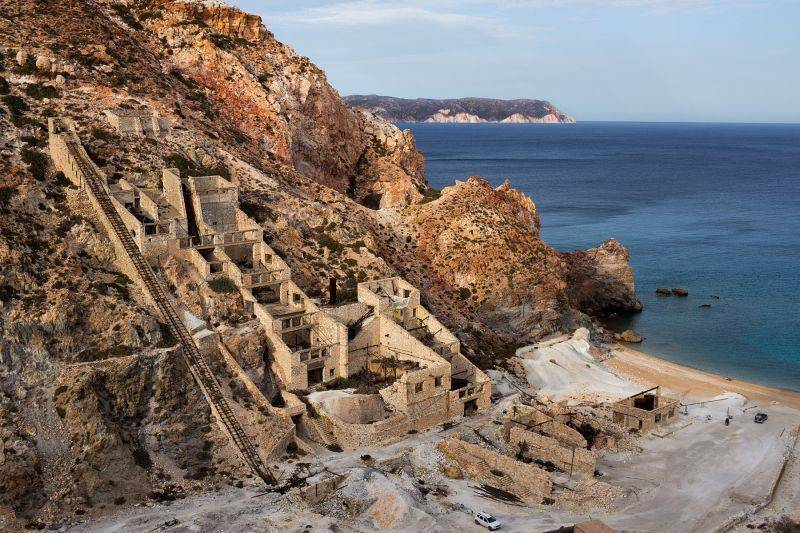 In Paliorema or Theioryheia you can combine your swim with a visit to one of the geologic sites of the island’s mining history. 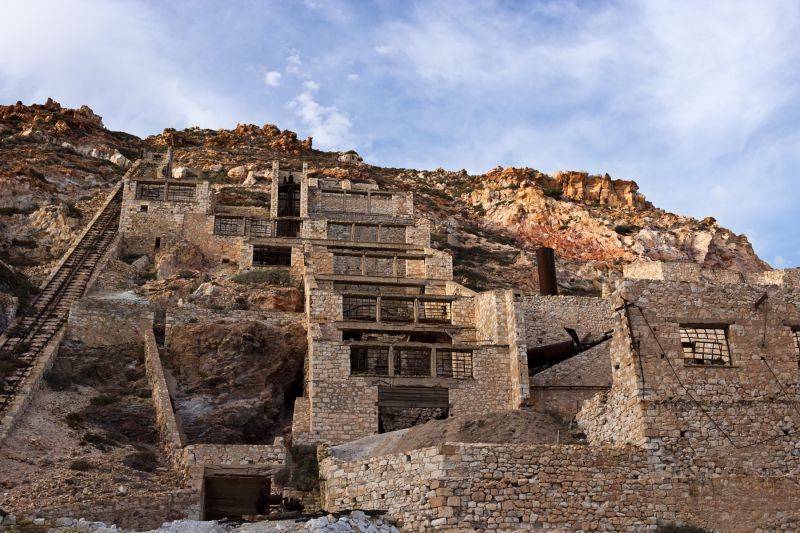 You can rest on the beach with the colorful pebbles and the fine sand and you can enjoy your swim viewing the old quarries for the mining of sulphur and the ruins of offices, spare parts and personal items of the quarries’ workers which compose an attractive landscape. 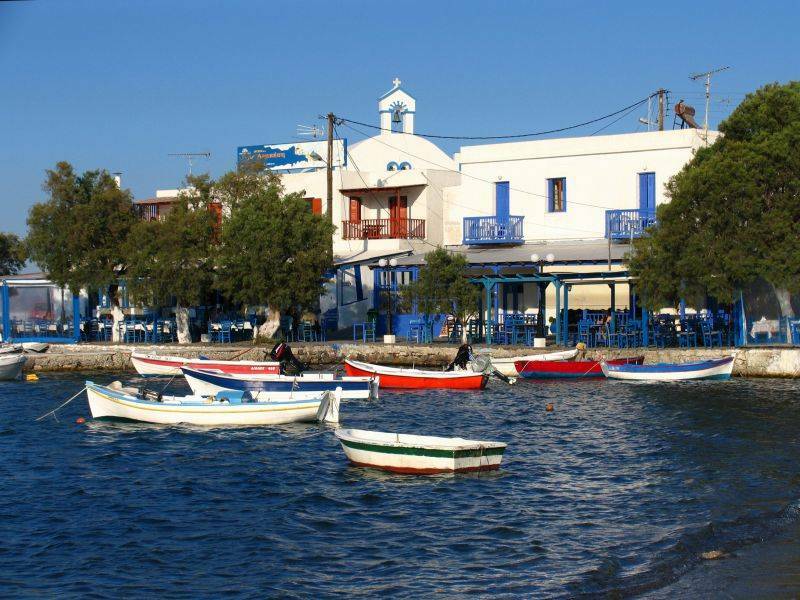 Pollonia is located 15 kilometres from Adamas (the island’s port) and 15 kilometres from the airport. 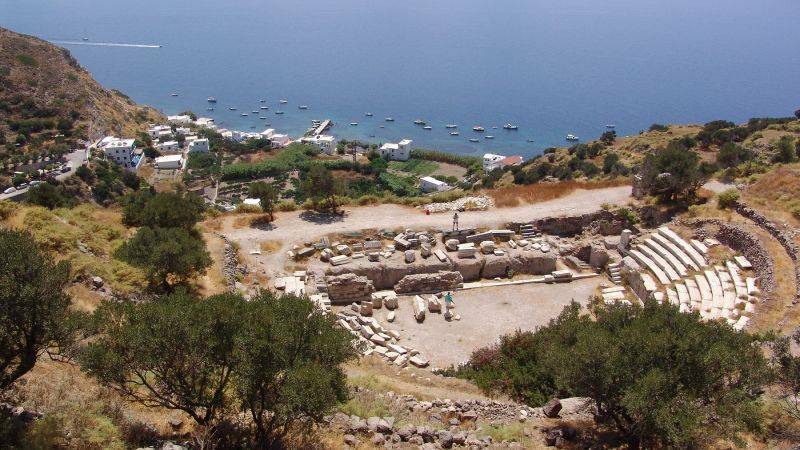 Close to Pollonia visitors will find the ancient ruins of Filakopi, which was one of the most important cities in the prehistoric Aegean. 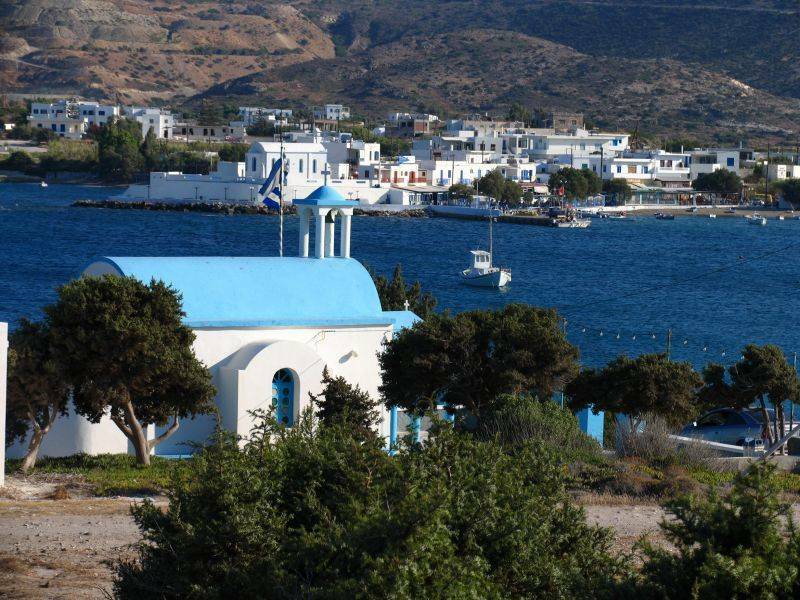 From Pollonia tourists can also visit the nearby islands of Kimolos and Poliaigo. 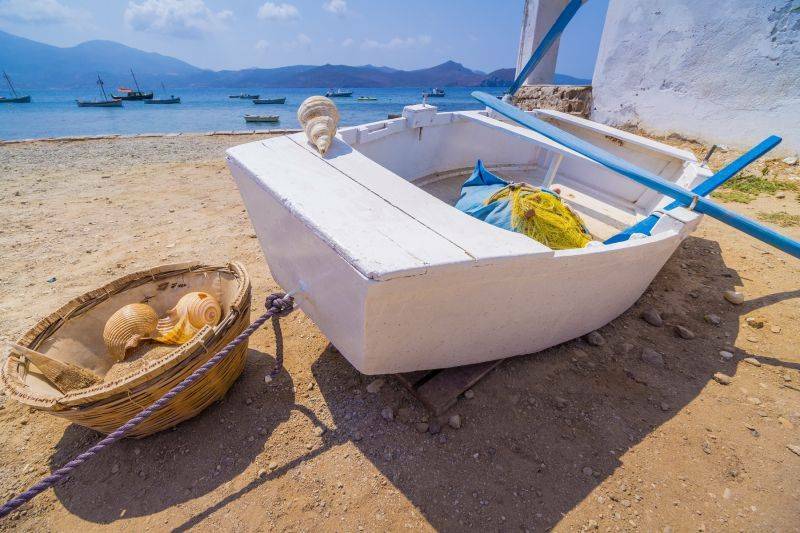 There are daily departures for the island of Kimolos and you can hire a small boat to explore the beautiful uninhabited island of Poliaigo with its splendid beaches. 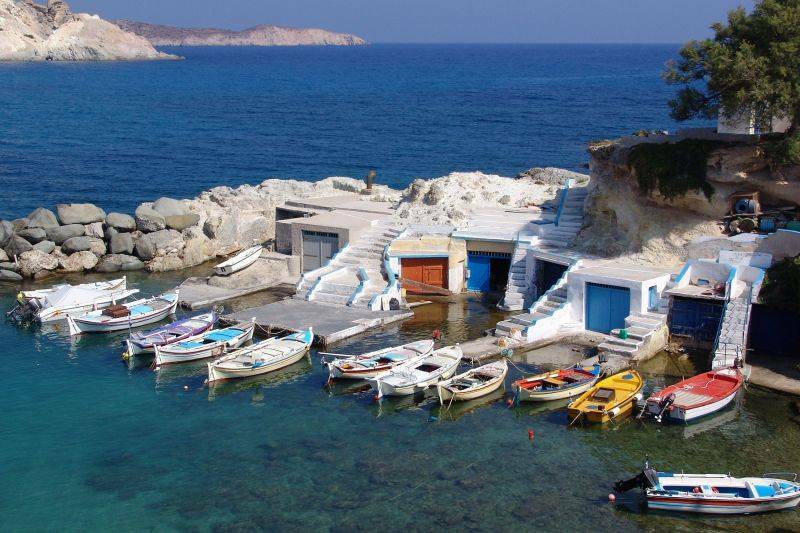 In Milos there are 5 museums which attract thousands of visitors from around the world every year. 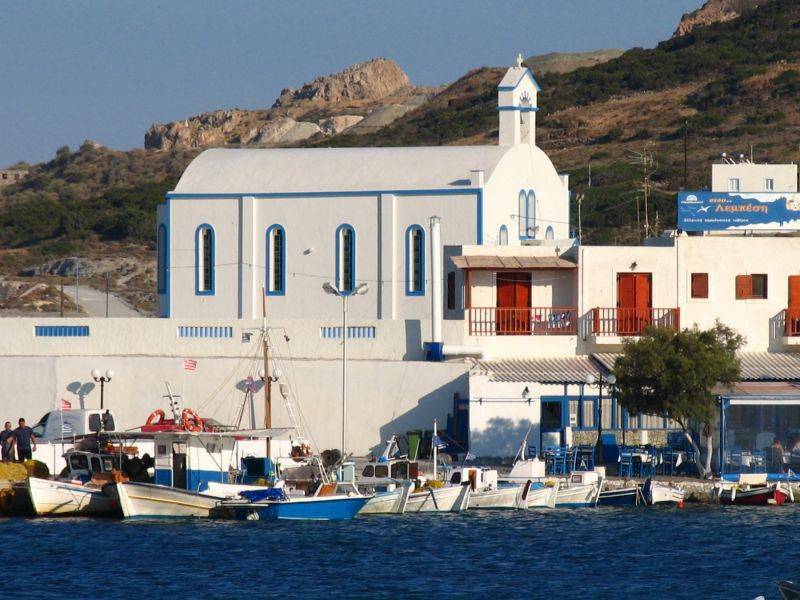 Mandrakia is another seaside settlement of Milos, with several well preserved «wires», waiting to accommodate the fisher boats during the winter. 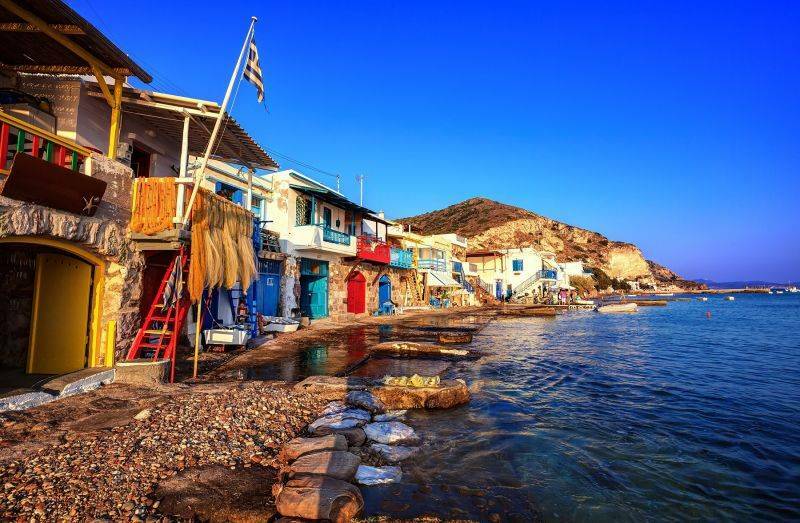 It is located about 5 km northwest of the capital of Milos, Plaka. It is an amazing beach with small pebbles. 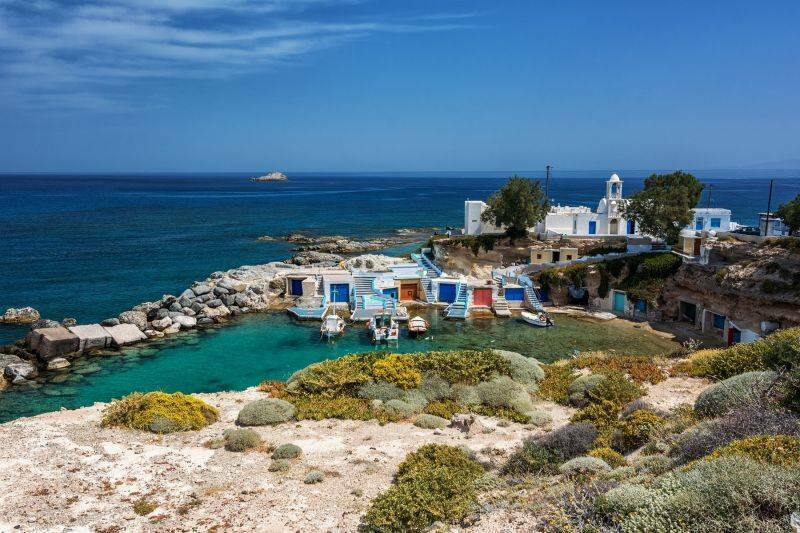 Klima is the most picturesque fishing village of Milos and is really worth-seeing. 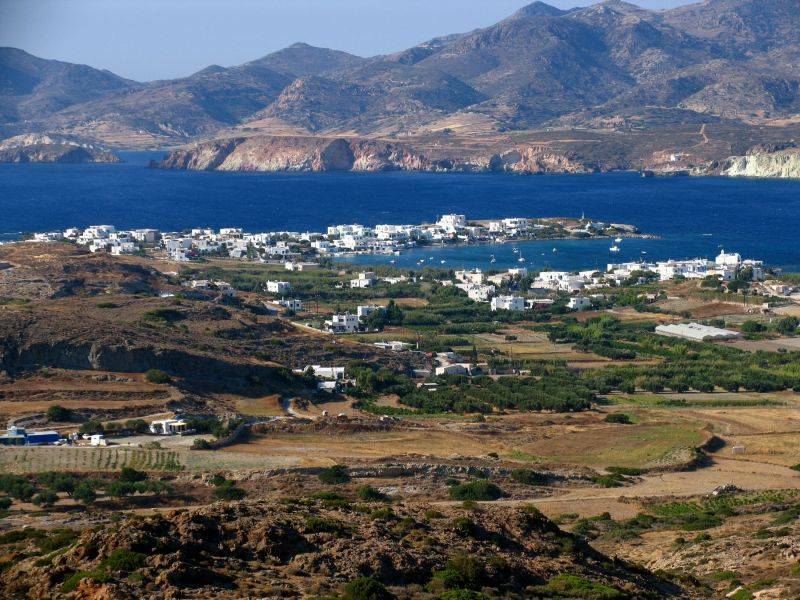 This very beautiful village is situated near Tripiti, on the side of the Gulf of Milos. 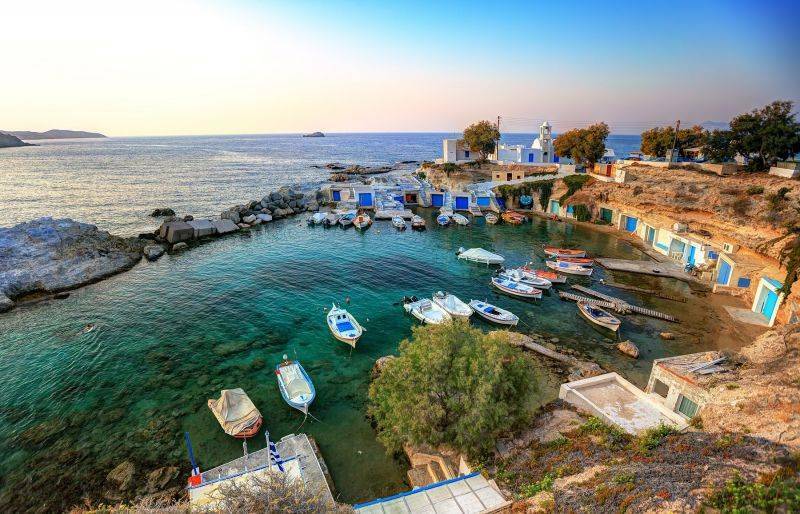 The scenic beauty of Klima is due to its syrmata, the fishermen houses that are carved into the rocks and have bright coloured wooden doors. The sunset there is an amazing experience. 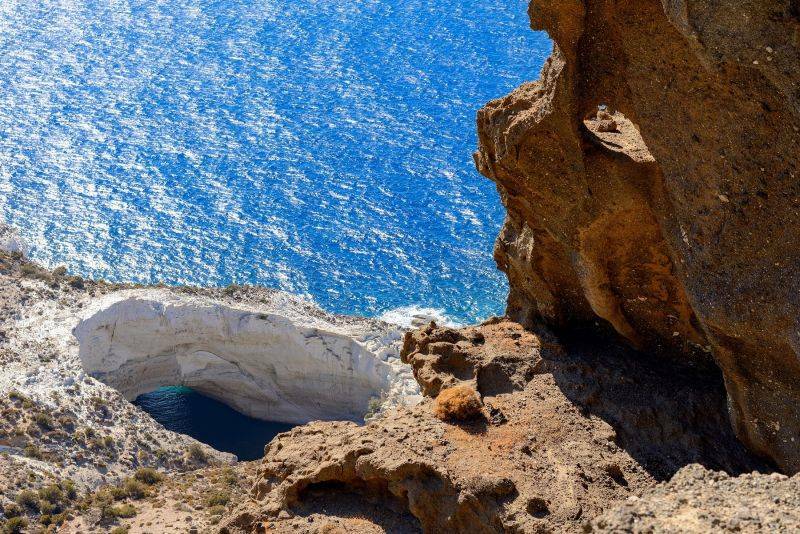 Fyropotamos is a small village with a beautiful beach in north of Milos. The sandy beach is surrounded by trees offering natural shade but also features sun beds and umbrellas. 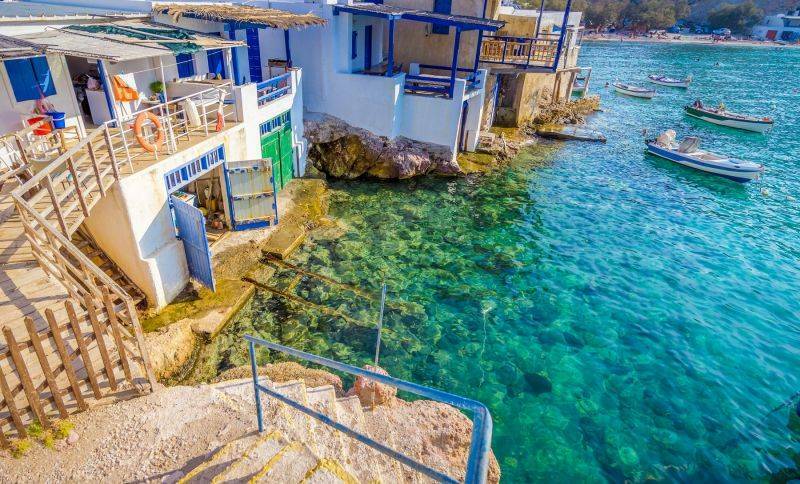 On the right side of the beach you will face the settlement with the «sirmata» (wires), which are found in almost all the coastal settlements in Milos. The so called «wires» are small buildings with a large door in front of the sea, in which fisher boats were stored during the winter in order to be protected from storms. 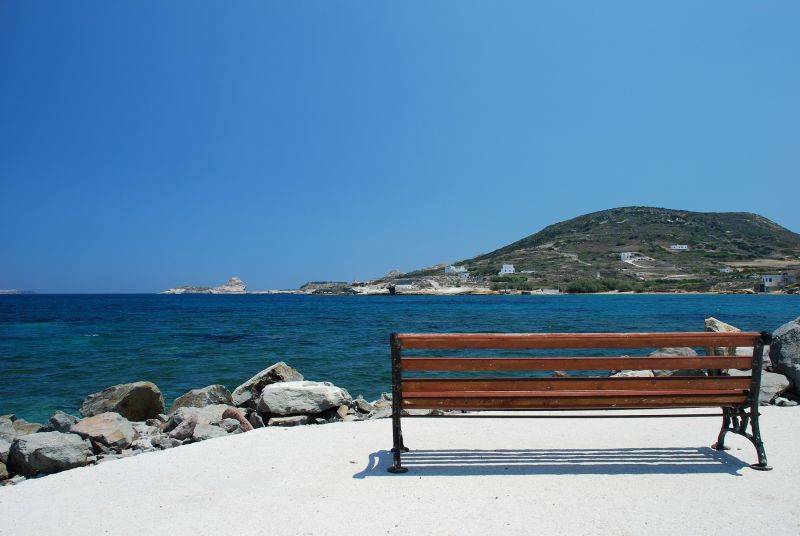 Kleftiko is found in the SW side of the island and the access it is possible only from the seaway. A characteristic rock in the sea and a cave with two entries give their stain in a unique landscape. 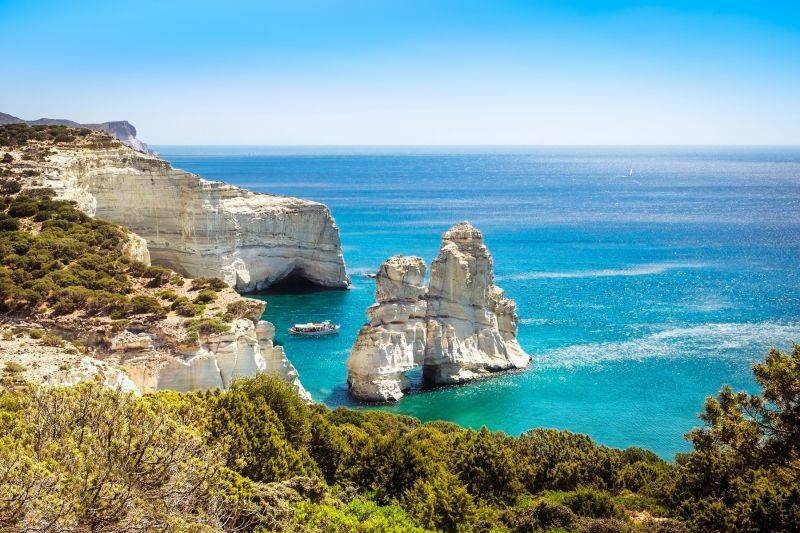 Even in your first visit, it will appear familiar, because photographs of Kleftiko exist in a lot of tourist guides about Greece. The magic of the landscape comes to complete the fable of hidden treasure of pirates, in a cave near in Kleftiko, that was the base of operations and also their den. The Catacombs are the subterranean cemetery of the first Christian centuries in Milos. 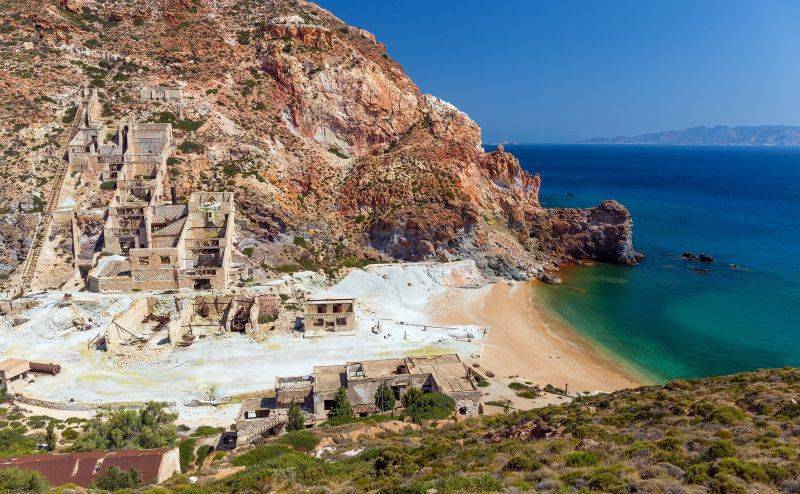 Located on the hillside southwest of the village of Tripiti in the area of the ancient city's ruins of the seaside village of Klima. In the area, there are smaller underground cemeteries, in the form of Catacombs. They are Milos’ most famous monument and unique in its kind in Greece Slabs of different sizes covered all tombs. Some arcosolia save painted decorations and fragments of inscriptions on the drum or conch for depositing offerings and lamps, and in some cases for the burial of infants. 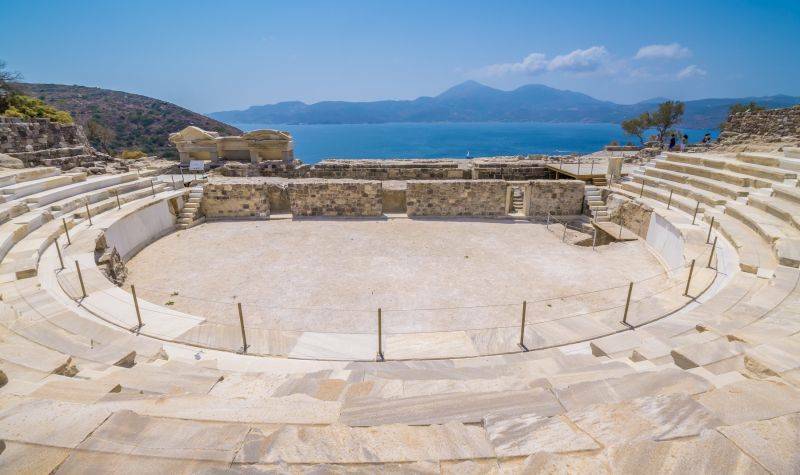 The ancient Roman Theatre was originally constructed by the inhabitants of the ancient city of Klima, possibly during the Hellenistic Age. Built on prominent spot, on the hillside, the theater overlooks the port, the view from there is spectacular and its acoustics are very good. So, quite often theatrical performances and music happenings take place there, as in its present shape the theater has a seating capacity of 700 spectators. On the way to Pollonia on your left you will see a small detour leading to the small and quiet seaside settlement of Agios Konstantinos. 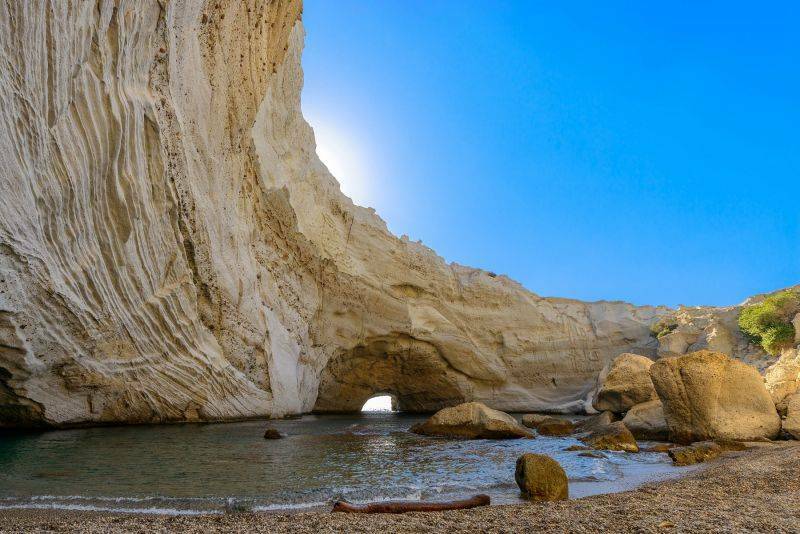 The settlement’s beach is quite beautiful and quiet, on its right side among the rocks two small caves are formed from where the waters come in and out and which are certainly worth exploring.